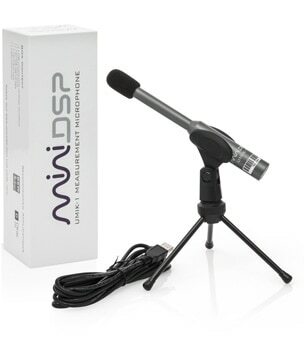 The miniDSP UMIK-1 is the perfect companion to audio analysis and Equalization programs. In this application note we will show you how to set up your UMIK-1 for use with the MathAudio Room EQ plugin for Foobar2000. Please note: miniDSP cannot provide support for third-party applications or hardware. This app note shows you how to set up the miniDSP UMIK-1 to use with MathAudio Room EQ as a starting point. Note however that other functions of the software are beyond the scope of miniDSP support. Thanks for your understanding. Download the latest stable version of Foobar2000 and install it on your computer. Download the latest version of MathAudio Room EQ plug-in from MathAudio website. Step 1: Open the foobar2000 preferences dialog (click File > Preferences or key CTRL+P). Step 3: Click the "Install..." button and select the component archive you just downloaded from MathAudio, or simply drag it to the list. Start Foobar2000, then click File - Preferences - Playback - DSP Manager. Select "MathAudio Room EQ" in the right pane and click the right-to-left arrow to activate it. Click the “Apply” button. After that click the "Configure selected" button to see the plug-in window. - Select the "Room Measurement" radio button to activate the Room Measurement mode. - Select the left (L) microphone input by means of the “Mic input” radio buttons. Then click the "In/Out" button (shown below) and select the UMIK-1 microphone input. - Copy your calibration file to the Documents -> MathAudio Room EQ folder. Then exit Foobar2000 and start it once again. The name of the calibration file will be shown at the top right corner of the graphical area as it is shown below. - Plan to make no less than 5-20 measurements. The measurement locations must be uniformly distributed within the area of possible locations of all listeners. - Place the microphone at your ear height. Set it vertically. The microphone should not be near reflective objects or sound absorbing upholstery. It is very convenient to use a tripod. - Click the "Start Measurement" button. - Wait until the end of the measurement (about 10 seconds). Then move the microphone to the next measurement location and click the "Yes" button in the prompt window. Repeat this procedure in all the necessary measurement locations. Click the "No" button in the prompt window when you will finish the last planned measurement. You will get the plots of frequency responses as it is shown below (your plots will be different). - Click the "Save preset" button to save the frequency response of your speakers as a .snr file. Click the "Room EQ" radio button. Sometimes speakers are not well balanced (i.e. one of them is louder than another). If your speakers are not well balanced you can click the "Stereo Balance ON" radio button to compensate for the disbalance. You can skip this step if the frequency responses of the left and right channels of your speakers look similar. Click the "Bright" radio button to get a standard flat frequency response of ideal speakers or click the "Neutral" radio button if you want to get the frequency response of ideal speakers with a h.f. roll-off. The latter reference response will ensure more neutral sound of your speakers. Move down the vertical slider and release it to cut out some part of the main resonances as it is shown below. The resultant processed frequency response of your room and speakers will be shown by a solid white line. It is possible to see that the main resonances of the resultant frequency response (solid white line) became much smaller. Such resonances added unnatural timbre to the sound. The removal of the resonances dramatically improves the sound. It is also possible to see that MathAudio Room EQ doesn't boost the spectral components lying below the dashed line. This important feature prevents the large excursions of the speaker diaphragm that can be caused by the ideal linearization of the frequency response. As a result you will not get a muddy sound that is peculiar to conventional linearizing equalizers. Make sure that the "Room EQ" radio button is selected as it is shown in figure (a). Play music. Remember the loudness of the processed sound of your speakers. Then click the "Bypass" radio button to listen to the original (unprocessed) sound and move the "Bypass signal volume" slider left until the loudness of the original sound becomes equal to the loudness of the processed sound: equal loudness is necessary for correct comparison of the processed and original (unprocessed) sounds. Switch "Room EQ" and "Bypass" radio buttons and adjust the position of the volume slider until the loudness of the processed sound will be equal to the loudness of the original (unprocessed) sound (see figures (b) and (c)). Compare the qualities of the processed and original (unprocessed) sounds. You need to make at least a few experiments to find the optimum location of the vertical slider. Too high location of that slider can result in too small improvement of the frequency response, however, too low location can result in too large excursions of the speaker diaphragm and corresponding non-linear distortion of the sound. The optimum location of the vertical slider corresponds to the maximum fidelity and transparency of the sound. Your ears have the final say. Move the vertical slider up and down a little and compare original and processed sounds. Don't forget to adjust the loudness of the original sound for correct comparison of the processed and original sounds. Different positions of the vertical slider result in different shapes of the frequency response. Repeat the audio test for different positions of the vertical slider and choose the best one. Leave the best position for the permanent use. Click the "Save preset" button and save the accurate state of the plug-in as a .snr file. This file will help you to restore the state of the plug-in if necessary.